The etymological meaning of ‘family’ is coming from the Latin word ‘familia’, which signifies a family or refers to the members of a household. 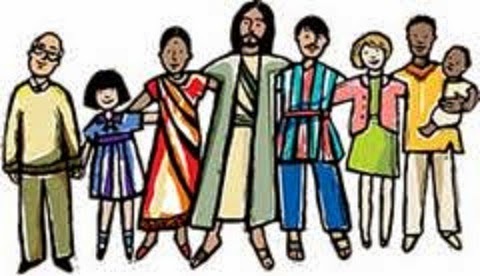 According to Catholic Culture Dictionary, the family is a group of persons who are related by marriage or blood and who typically include a father, mother and children. A family is a natural society whose right to existence and support is provided by the divine law. According to the Second Vatican Council, “the family is the foundation of society,” (The Church in the Modern World, II, 52). In addition to the natural family, the Church recognizes also the supernatural family of the diocese and of a religious community, whose members are to cooperate for the up-building of the Body of Christ (Decree on the Bishop’s Pastoral Office, 34; and Dogmatic Constitution on the Church, 43). The love and respect of Jesus for His mother and relatives is unquestionable. But in today’s gospel, it seems like He ignores His own mother and relatives when they press to see Him. As Indians, we are known to be family-oriented people. Family for us is a first priority. For occasions that bring families together like birthdays, funerals, weddings, anniversaries, reunions, etc., it will take a major reason for a family member to be absent. However, Jesus invites us to higher aspects of life. Firstly, Jesus teaches His disciples a truth about the kingdom of God that the deepest relationship of life is not merely a blood relationship. He changes the order of relationships and shows that true kinship is not just a matter of flesh and blood. He pointed to another higher reality of spiritual kinship, that is, the family of God. Therefore, Christianity is more than doctrine, precepts and commandments. It is first and foremost a relationship, a relationship of love and unity with the Trinitarian God. Secondly, we should be happy because Jesus expanded the number of persons closest to his heart that includes, “all those who hear the word of God and put them into practice.” In these truth therefore, only those who fulfill the Father’s will in their lives are Christ’s brothers and sisters, parents and his intimate friends. It is when we do God’s will that Christ is supremely honored and glorified. How do we discern God’s will in each moment of our lives? Sometimes it is difficult but challenging. A priest, in his homily, said that the necessary ingredients for discerning God’s will include: a heart truly set on loving God above all else, interior silence, patience to wait and to listen, daily prayer, freedom from the attachment to sin and the help of a prudent, experienced spiritual director. Building these elements into one’s life make the discovery of God’s will much easier, especially in the face of obstacles like our pride and vanity, our sensuality and materialism. At the end let us reflect these words coming from an early martyr who said, “A Christian’s only relatives are the saints”. And so those who follow Jesus Christ and who seek the will of God enter into a new family, a family of saints here on earth and in heaven.